Electric and battery-powered hydraulic PE10 Series pumps offer a high performance portable power source for hydraulic cylinders and tools up to 25 tons in a compact package. Pumps deliver 15 minutes of continuous operation at 700 bar on a single operation. If you’re looking for a portable power source for hydraulic cylinders and other hydraulic tools, we have a range of Power Team battery hydraulic pumps that offer high performance, wherever and whenever you might need it. 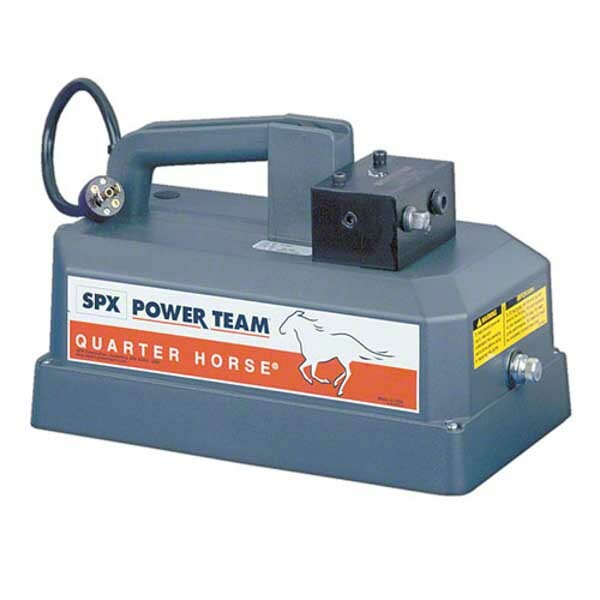 Compact yet powerful, our portable SPX battery hydraulic pumps have the ability to power tools and cylinders up to 25 tons, as well giving you the option for a rechargeable battery pack for the ultimate in portability. When you buy your battery powered hydraulic pumps from SGS, you can choose from a number of high performance models that can deliver 15 minutes of continuous operation at 10,000 psi on a single battery. Our battery powered pumps can be operated in any position, with 24-volt hand and foot switches available for all the AC powered models. As standard, the pump has base mounting holes for easy installation for fixed applications, as well as high impact housing with flame retardant construction. When you shop from our range of Power Team battery hydraulic pumps, we’ll include a Lifetime Marathon SPX Warranty as standard, as well as a free 60-day returns policy. Plus, you can trust that you’re buying a high-quality product as we use our precision engineering expertise to ensure that our customers are receiving only the best products. Take a look at our full range of battery powered hydraulic pumps to find a high performance portable power source that meets all your requirements.